Experience the peace and tranquility of a balloon flight over the exquisite Kent and Sussex countryside in an exclusive hot air balloon. The VIP way to fly - just 2 passengers, the pilot, and champagne floating through the early morning sky! (Valid weekday mornings excluding Bank Holidays). 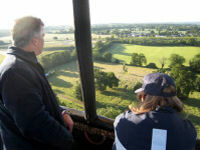 An exclusive for 2 champagne hot air balloon flight from Shugborough Hall valid for weekday mornings only. A once in a lifetime experience accompanied by champagne that you can't afford to miss out on. 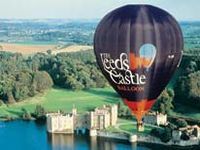 A champagne hot air balloon flight from Eastnor Castle valid for mornings, evenings and weekends. A once in a lifetime experience for two that you can't afford to miss out on. A champagne hot air balloon flight from Worcester Racecourse valid for mornings, evenings and weekends. A once in a lifetime experience for you and a friend- accompanied by champagne that you can't afford to miss out on. Champagne hot air balloon flight over th beautiful Cotswolds. Voucher valid for mornings, evenings and weekends. A once in a lifetime experience for you and a friend. Accompanied by champagne - you really can not afford to miss out. Champagne hot air balloon flight for 2 over Shakespeare Country valid for mornings, evenings and weekends. A once in a lifetime experience accompanied by champagne that you really can't afford to miss out on. A champagne hot air balloon flight for 2 from Shugborough Hall in Staffordshire, weekday mornings only (excluding bank holidays). A once in a lifetime experience accompanied by champagne that you can't afford to miss out on. 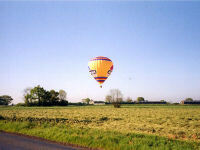 A champagne hot air balloon flight from South Wales, weekday mornings (sunrise) only (excluding bank holidays). A once in a lifetime experience with champagne or soft drinks served either during or just after the flight. Enjoy the splendour of the majestic Sussex countryside from a hot air balloon - with two scheduled balloon flights per day from prestigious launch venues across Sussex, there is no better way to view this beautiful part of southern England. 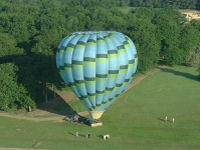 A champagne hot air balloon flight from Shugborough Hall in Staffordshire valid mornings, evenings and weekends. A once in a lifetime experience accompanied by champagne that you can't afford to miss out on. A champagne hot air balloon flight from Worcester Racecourse valid for mornings, evenings and weekends. A once in a lifetime experience accompanied by champagne that you can't afford to miss out on. 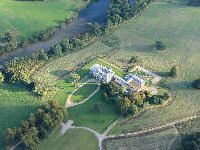 Champagne hot air balloon flight from Wood Norton Hall Hotel in the beautiful Vale of Evesham. valid for mornings, evenings and weekends. A once in a lifetime experience accompanied by champagne that you really can't afford to miss out on. Champagne hot air balloon flight from Warwick School. Voucher valid for mornings, evenings and weekends. A once in a lifetime experience accompanied by champagne that you really can't afford to miss out on. 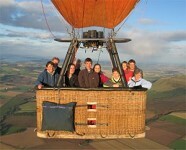 A champagne hot air balloon flight from Tissington village valid for mornings, evenings and weekends. A once in a lifetime experience accompanied by champagne that you can't afford to miss out on. Champagne hot air balloon flight over th beautiful Cotswolds. Voucher valid for mornings, evenings and weekends. A once in a lifetime experience accompanied by champagne that you really can not afford to miss out on. Champagne hot air balloon flight over Shakespeare Country valid for mornings, evenings and weekends. A once in a lifetime experience accompanied by champagne that you really can't afford to miss out on. A circa 1 hour hot air balloon flight over the Perth & Kinrosshire countryside near Perth. Includes champagne and a commemorative certificate signed by your pilot after the flight. A circa 1 hour hot air balloon flight over the Scottish Borders. Includes champagne and a commemorative certificate signed by your pilot after the flight. 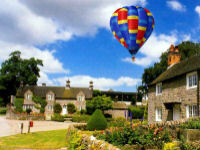 A champagne hot air balloon flight from Rowsley near Chatsworth valid for midweek Morning and Evening flights. A once in a lifetime experience accompanied by champagne that you can not afford to miss out on. 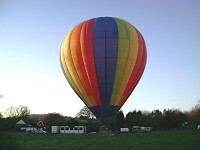 A champagne hot air balloon flight from Tissington village valid midweek morning and evening fights. A once in a lifetime experience accompanied by champagne that you can't afford to miss out on. Champagne hot air balloon flight from Warwick School. Voucher valid for midweek Morning and Evening flights. A once in a lifetime experience accompanied by champagne that you really can't afford to miss out on. This is a real must for all visitors to Reading. 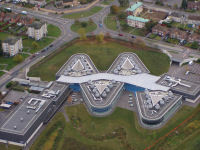 Whether you are a Royals Fan or not the John Madejski Stadium is a spectacle from the air. Then there's the Wind turbine and the Thames and the prison.....Don't forget your camera. A champagne hot air balloon flight from Shugborough Hall in Staffordshire, weekdays only (excluding bank holidays). A once in a lifetime experience accompanied by champagne that you can't afford to miss out on. 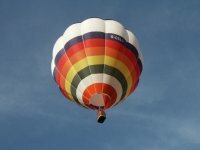 A champagne hot air balloon flight from Rowsley near Chatsworth valid for weekday mornings only (excluding bank holidays). A once in a lifetime experience accompanied by champagne that you simply can not afford to miss out on. 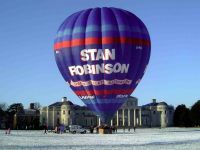 A champagne hot air balloon flight from Shugborough Hall in Staffordshire, weekday mornings only (excluding bank holidays). A once in a lifetime experience accompanied by champagne that you can't afford to miss out on.